At video game conference E3, there was no sign of the Microsoft smartwatch that some believe will make an appearance there, sometime before the show ends on Thursday. But a Windows Phone model showed up, sort of. 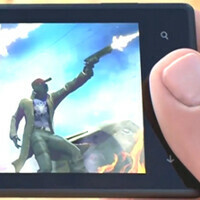 In the Insomniac game Sunset Overdrive, published by Microsoft Studios, the main character is seen carrying a Windows Phone powered handset. Sunset Overdrive is a third person shooter for the Xbox One, and Microsoft wasted no time promoting the Windows Phone platform in the game. The title will be released sometime in 2014. You can check out the trailer for the game by clicking on the video below. At around the 1:41 mark, you'll see the image of the phone. The Windows Phone logo is covered up, but the navigation icons still match up. Now let's hope that the Microsoft smartwatch makes a real-life appearance before E3 comes to an end. Or just buy a PC, PS4 and an Xbox One and laugh at all the idiots fight about it. Obviously multiplats are superior on PC and then you use the consoles for exclusives. Can PC play Forza Motorsport? B..but there is no Flappy Birds on the PSN! I agree! It looks like the HTC 8X. It's not a generic WP... it looks EXACTLY like HTC 8X. ...generic... pfff... coming from so called phone experts.